I spotted a sale bulletin that listed Swiss Model 1918 bayonets in very good condition for one half of their previously listed price. These were needed to go with my Schmidt-Rubin 1911 and K31 rifles. So two bayonets were ordered, but I was blocked at checkout. The company will not ship bayonets to Pennsylvania because their legal staff say a bayonet could be construed as a dagger and thus it is not legal to ship same to Keystone State residents. The company would ship hunting knives, folding knives or pen knives. I spoke to customer service and pointed out that bayonets are sold legally in Pennsylvania at gun shops, gun shows and other retail stores. I offered to get a letter from my county district attorney attesting to the legal status of bayonets. All to no avail. Even a supervisor and manager at the company would not budge. What to do? You guys got the same rule maker as we do ? That's a bit ordinary Gil. I think you have taken the only really viable option mate and that is to ship them to somebody else for on forwarding to you. I think you figured out the best bet and that is to ship to somewhere else, where it can be shipped to you, but better check with the state regs and see if there's some sort of hick-up over shipping bayonets. It could just be their shipper. I had a UPS store recently refuse a guy trying to ship a laser pointer that goes on a pistol. All he had to say was that it goes on a drill press and they'd let him send it. They may deal with only one shipper and they may be of the anti gun ilk, who knows. I'd like a K31 bayonet... care to share the supplier's name? PM me if you like. No worries if you don't. Ok just googling about the bayonet. It is true that some (most?) 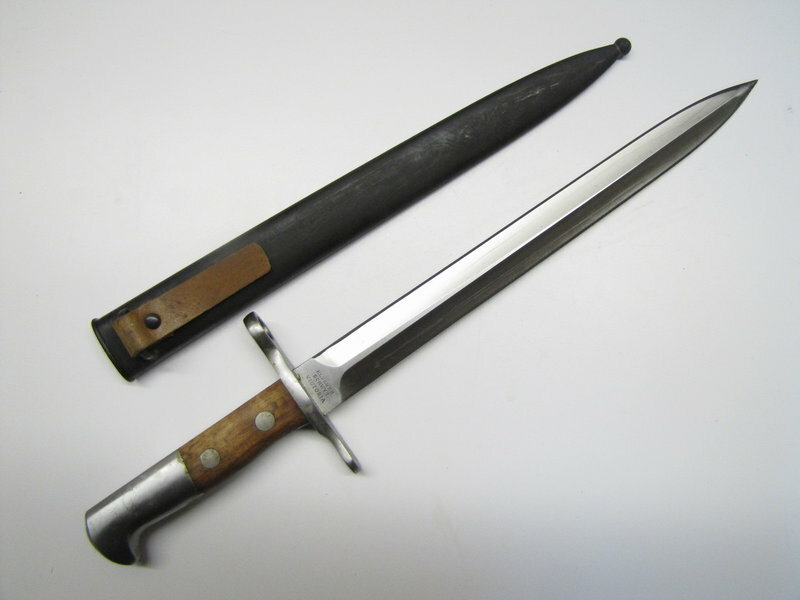 version of K31 bayonet ARE dagger, particularly models after the 1918 issue version. I just did the same Gelan, and I do believe you are correct mate. The bayonet is like an oversized Sykes Fairbairn dagger. Gil took the best option which is sending it to someone else, but he may have to collect it in person to get it home. I know I might be opening a small can of worms here...but in reality there isn't a lot of difference between the K31 bayonet and other bayonets. The main difference I can see is the K31 bayonet is sharpened on both sides, whereas the other bayonets are only sharpened on one...which I suppose technically makes the K31 more like a dagger. Is there a restriction for carpenters on the length of their nails they use in Pennsylvania? Bajonets for the K31 are very nice, they are Swiss you know. I gave my arsenal-new Mauser bajonet to my future son-in-law. One has to do strange things to get the daughters out of the house... but I still have the "sword" that fits a Lee Enfield and the small nice "dagger" that fits the SA-FN. The right education teaches people to dress themselves and their rifles too... what are the women in Pennsylvania allowed to wear? Out here Aloys, in Australië mate, we call them Pig Stickers. The blade is very similar to the Sykes Fairbairn dagger. As for deer, I use any knife that is sharp enough and strong enough to cut their throat. I used to admire Pennsylvania's common sense, but your current Attorney General is a lunatic. Now I can't renew my PA non-resident by mail as before, and my non-resident Utah permit isn't recognized at all. Not surprised that he can't tell the difference between a "dagger" and a bayonet. Good luck. Thus due to a change that now requires photo and electronic signature into their system !! !